This color-shaded relief view of the moon's far side, taken by NASA's Lunar Reconnaissance Orbiter, is part of the highest-resolution near-global lunar topographic map ever created. 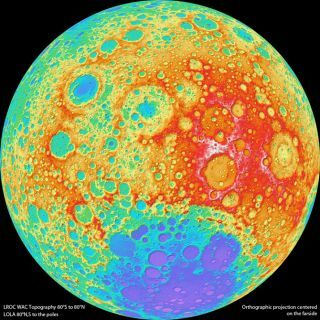 "Our new topographic view of the moon provides the dataset that lunar scientists have waited for since the Apollo era," said Mark Robinson of Arizona State University, principal investigator of the Lunar Reconnaissance Orbiter Camera (LROC), in a statement Thursday (Nov. 17). "We can now determine slopes of all major geologic terrains on the moon at 100-meter scale, determine how the crust has deformed, better understand impact crater mechanics, investigate the nature of volcanic features and better plan future robotic and human missions to the moon," Robinson added. The new map was created using thousands of pictures acquired by the Wide Angle Camera, part of the LROC imaging system. The Wide Angle Camera maps nearly the entire moon every month from LRO's average altitude of 30 miles (50 kilometers), building up a record of how the lunar surface looks under varying lighting conditions. In addition to its mapping role, the spacecraft has also spotted several historic artifacts of moon exploration, including NASA's Apollo landers and the boot prints left behind by moon-walking astronauts during the six manned lunar landings between 1969 and 1972. But even with the small polar blank spots, the new map is still plenty exciting, researchers said. "I could not be more pleased with the quality of the map – it’s phenomenal!" Robinson said. "The richness of detail should inspire lunar geologists around the world for years to come."